We love our bathing rituals, and not just for the obvious hygienic reasons! What we love is the ability of a bath to be a DIY health and beauty treatment all in one. According to the concoction we decide to mix with water, a bath can be detoxing, relaxing, reviving… Or all three. This is how our love affair with “bathing” began historically. Long before it became the scented bubble bath that is common now, bathing was first and foremost known as Hydrotherapy, a therapeutic treatment for body and mind. Hydrotherapy (water therapy) involves using water to ease physical pain and symptoms of illness. This can include anything from steam baths and compresses, to the use of water sprays and bathing at a range of temperatures. It is one of the oldest forms of medical treatment, initially made popular by the Romans who built baths around various hot springs and used these as a place for health and socialising. Of course baths were also beautifying, as demonstrated by Cleopatra’s penchant for skin-softening milk baths. Bathing lost its appeal in Medieval times, when the church despised the immorality of bathhouses and medical opinion actually discouraged taking baths. Astonishingly, in this time it was believed that bathing would “weaken the organism and cause infections or disease”. In Europe, bathing had a revival only in the 1800s when word spread of the therapeutic properties of salt water and people would flock to the seaside to cure all sorts of conditions. In the 19th Century, bathing scenes were also de rigueur in classicist, realist and impressionist art, and baths truly became temples of leisure. Then, in the first half of the 20th Century, some institutions began installing communal baths to help treat children who had suffered muscular, skeletal and nerve damage from diseases such as tuberculosis and polio. It is only in the second half of the 20th Century that spas became the beautifying havens they are known as today. Let’s take a look at some of our favourite types of bathing rituals in more depth. Make like our ancestors and burn incense while you bathe. Historically, incense has been used to uplift the spirits, heighten the senses, and bring peace and harmony to the mind. 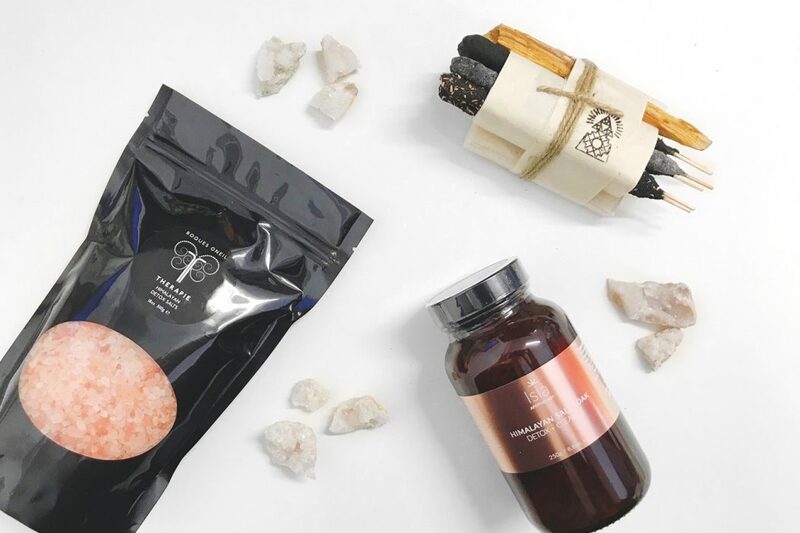 The Incausa Bath & Meditate Set is a bundle of four mixed handmade Breu resin, Palo Santo, White Sage, Chacrona and Jagube artisanal incense sticks. It also includes an essential oil-based vegan soap. This is a lovely option for creating your own bathing rituals at home. The Chinese have been using medicinal herbs for over 5,000 years. Later in 1,500 BC, Ancient Egyptians and Babylonians would also take herbal baths for health and cosmetic purposes. Then, lavender became a favourite of the Romans. Today it is known that the anti-inflammatory, anti-microbial and analgesic properties of aromatic herbs are released when steeped in hot water. As a result, herbal baths can be effective remedies for relieving stress, and muscle aches and pain. They are also believed to help ease inflammatory skin issues, such as eczema and psoriasis. Fighting off a cold? Try the Therapie Roques O’Neil Protect Bath & Shower Essence, a #CONTENTapproved favourite. Simply pour a cap of this essential oil mixture into warm, running water and bathe for 10-15 minutes to soak up all the goodness! It is abundant in anti-viral oils like immune-supporting lemon myrtle, warming ginger and pepper, and fortifying tangerine. Again, China seemed to be at the forefront of this trend in 2,700 BC when they were mining and using salt for health purposes. Later in Egypt, Cleopatra soaked in the mineral-rich waters of the Dead Sea for a softer and smoother skin. Then in Greek times, Hippocrates promoted bath salts for their healing properties. In Europe, this became popular again in the 19th Century and has been ever since. In fact, the ocean contains all the vital trace elements, mineral salts, vitamins and amino acids we need. It is also considered that the magnesium content of sea water may have a calming effect on the nervous system, which would explain why we find sea water bathing so relaxing and restorative! To soak in the benefits of Thalassotherapy at home, get hold of Isla Apothecary Himalayan Detox Bath Soak or Therapie by Roques O’Neil Himalayan Detox Salts, both which contain powerful trace minerals including magnesium, calcium and potassium, essential to the human body for supporting nutrient absorption, circulation and balancing body pH. Isla Apothecary’s Himalayan Detox Bath Soak consists of patchouli to encourage new cell growth and soothe problematic skin; sweet orange and grapefruit oils to balance and cleanse; and French pink clay to hydrate, rejuvenate and restore a natural glow. It’s an important ally for mature skin and the perfect antidote to stress, fatigue and jet lag. After your bath, follow by slathering on some #CONTENTapproved favourites for soft, smooth skin all over. De Mamiel Salvation Body Oil is a revitalising formula that has been created using natural and organic essential oils including baobab, rosehip and coconut for bright and healthy skin. An infusion of ylang ylang, rosewood and jasmine will leave floral fragrance on your skin. Team with De Mamiel Soothe Oil if you are still feeling anxious after your bath. The consoling blend of herbs, watermelon seed oil and passionflower oil provides a sense of balance. AUM Aromatherapy Unify Body Oil and Meditate Body Oil were developed to support the senses when you need a breather. With patchouli as its base note, Unify balances body and soul while soothing the skin with sandalwood. Meditate harnesses the calming properties of lavender and rejuvenates the skin with grape and cajeput. Nuori Vital Body Balm and Perfecting Body Oil are Scandinavian products centred around the concept of ‘freshness’. The Body Balm is an intensely hydrating treatment that moisturises and restores skin elasticity thanks to avocado oil and shea butter. The luxurious Body Oil is packed with grapeseed, apricot kernel and avocado oils, therefore it’s delicately scented and nourishing.